Finally, the apocalypse has begun! (Wow, I never thought I'd write that sentence.) 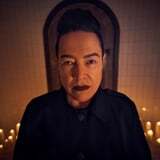 Now that American Horror Story: Apocalypse has launched with a dark and spooky premiere, fans are scrambling to figure out the game of the season. In the candlelit depths of Outpost Three - which may have been a male coven, previously - our uncertain cast of characters are slowly going crazy as the world remains uninhabitable. And with the arrival of our Antichrist Michael Langdon, who knows what the future may hold? Speaking of the future, I was doing some math about the timing of the season, and there's something strange about the dates that's just not adding up. The apocalypse begins in April 2018, and Murphy was referring to the time jump. This means the bulk of the season would feasibly take place in October 2019. The apocalypse begins 18 months from Murphy's hint; the first half of the episode takes place in October 2019, then we leap forward 18 months, to April 2021. OK, sure. Either way, that's all fine and dandy - except for one thing. If you look over the full timeline for the American Horror Story universe, you'll realize the scope of all seasons stretches until 2022. Yep, Hotel does go that far into the future; the last 18 minutes of the season finale take place on Devil's Night (Oct. 30) in 2022. If you accept either of the above conclusions, both take place before the finale of Hotel. And, if it is indeed canon, that event has to have taken place in the universe, even in spite of season eight's apocalypse. So what does this mean? Well, for one, there's always the chance it could just be a huge oversight. I mean, maybe it'll just be a glaring plot hole, a black mark on the series as a whole. But it's also worth considering the fact that this is a mystical and magical season. We have witches and demons wandering around. Is there a chance the apocalypse is somehow reversed through some magical event?! Is it not actually an apocalypse? We're not sure just yet, but this could be a major hint at what's to come. For the record, I hope it's not a massive plot hole.